In this guide we’ll take a look at how easy it is to install WordPress using an App Installer or manually via FTP. WordPress is the most popular Content Management System (CMS) for websites. According to W3Techs, 60% of all websites which use a CMS, use WordPress and the second biggest CMS (Joomla) only powers 6% of CMS websites – so WordPress is the largest CMS by a long shot! 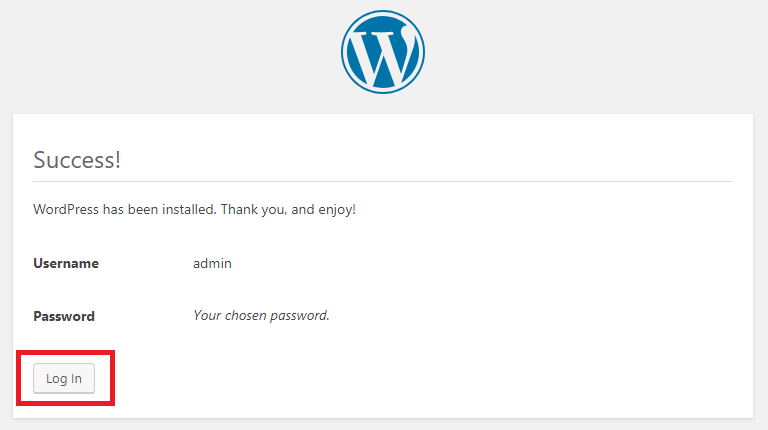 In this guide, we’ll take a look at the app installer (Softaculous), to demonstrate how easy installing WordPress can be. If you’d prefer to take full control and install WordPress manually, you may be interested in our manual installation guide which you can find on our support centre. Scroll down to the section labelled ‘SOFTACULOUS APPS INSTALLER’, and click ‘WordPress’ from the ‘Scripts’ sub section. Custom Install – provides additional options such as setting the HTTP protocol, Site Name, Database Name and Table Prefix, among other options. Recommended for users with experience managing Domains, Web Hosting, SSL Certificates and WordPress. In this step, you’ll need to choose the domain you would like associated with your website. There is a second option, to specify the directory where your files will be stored – if you are unsure about this, leave it blank. This step is really important because you will be creating your admin account, to log into your website. I recommend (for security reasons) using a unique username such as your name and the initials of your website, and avoid using usernames such as admin, administrator, web, web master, etc. In addition, you should create a secure password and a secure email address (if you have a Gmail email address, use that). While it’s not compulsory I recommend selecting this option to install the Loginizer plugin. Loginizer helps to secure your WordPress website from Bruteforce attacks. You should definitely include your email address for email installation details and then click install. The email confirmation will provide a record of everything you’ve just setup for your new WordPress website. In addition to the options in Quick Install (Step 4.1.1 – quick install: software setup) – custom install allows you to choose the protocol. This is necessary if you have an SSL certificate installed on your domain name to allow you to set the protocol to HTTPS. If you do not have an SSL certificate installed – you should use the HTTP protocol. If you are unsure which protocol is right for your installation, you might be better to use the quick install option. 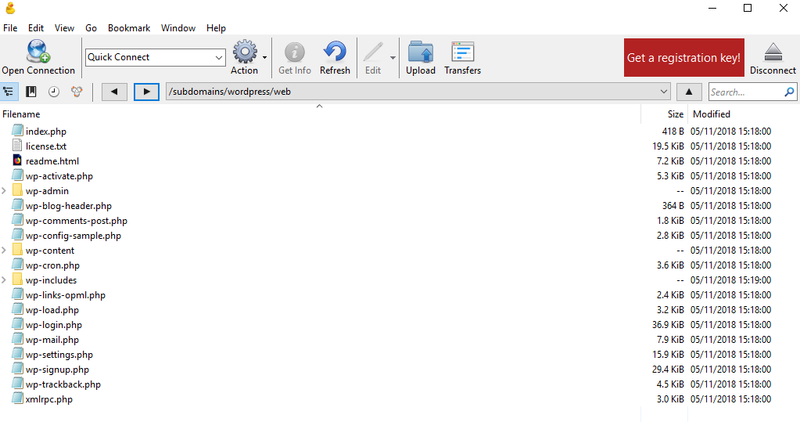 In this step you can add your company or website name, and a short description (keep this to a single sentence). This option is the same in quick install and custom install. Choose the primary language you will be publishing content in and which your website visitors read and understand. I recommend you do not change the advanced options unless you have previous experience managing web hosting accounts and WordPress websites. 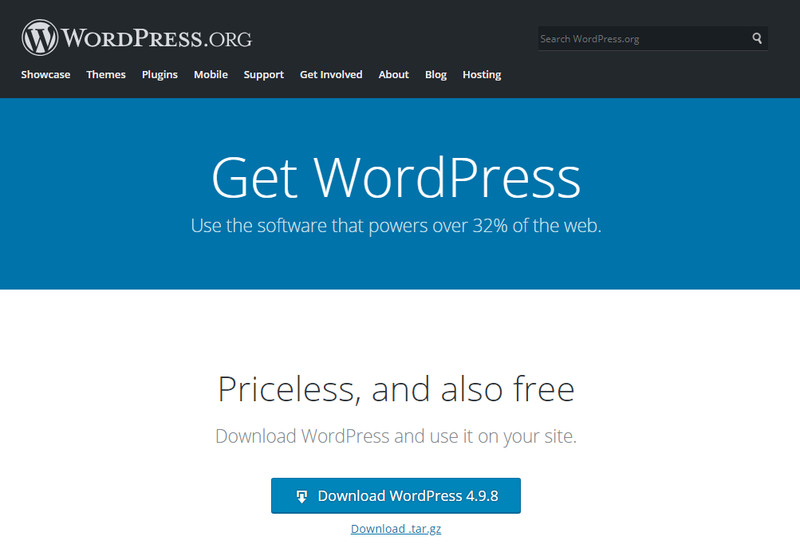 Firstly you will need to download the latest version of WordPress from WordPress.org. Once you have downloaded the zip file you will need to extract it on your computer. In the example below we have used WinRAR to extract the folder. The next step is to create your database within your Control Panel. If you are unsure on how to do this, please use the following guide for assistance. You will now need to upload the WordPress files to your public /web folder via FTP. In our case we used Cyberduck, but you can also use a different FTP client of your choice. In Cyberduck login via FTP. Navigate to your /web folder, and click Upload. 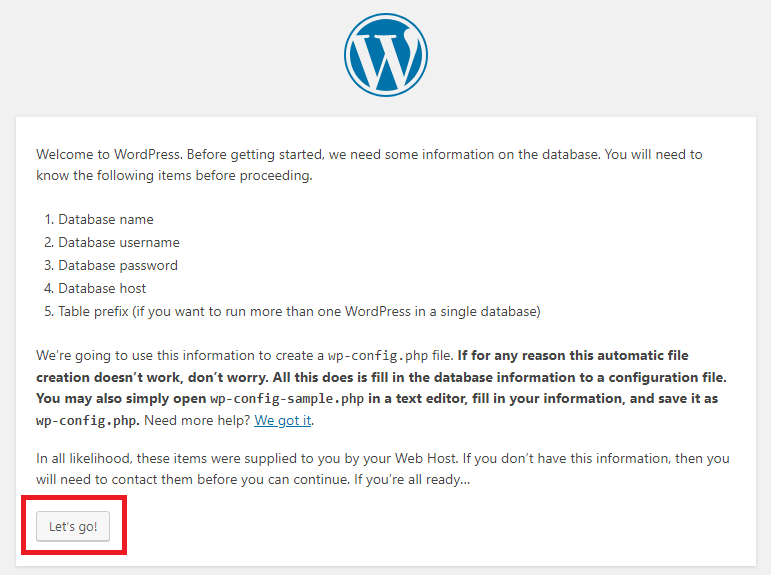 Select the WordPress files that you extracted earlier on, and click Choose. The WordPress files will then be uploaded to your /web folder. In a web browser simply navigate to your website. 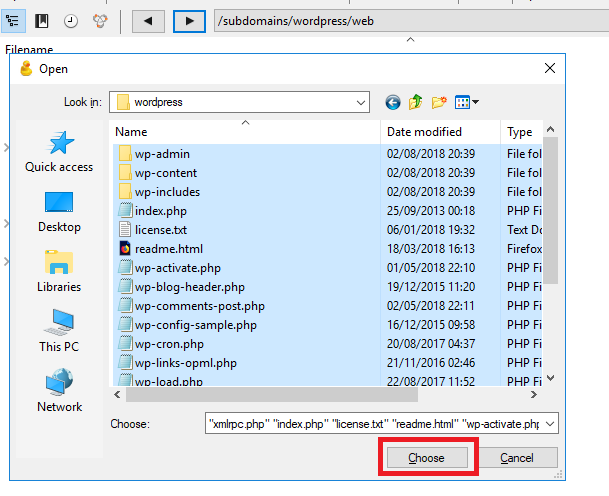 If your website address is yoursite.com and you have uploaded the WordPress files to your root /web folder, you simply need to enter yoursite.com in the address bar. 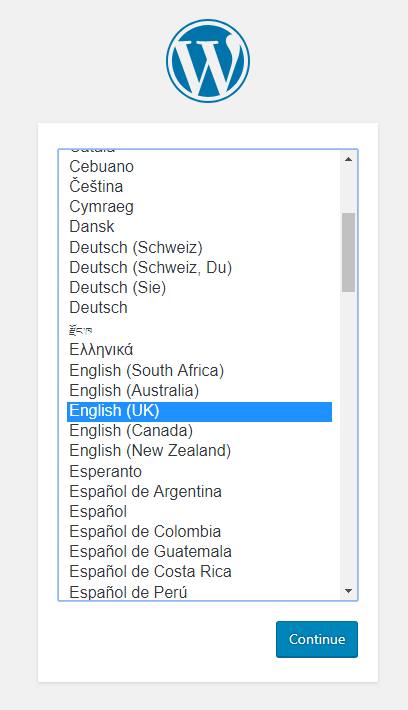 The first step will be to select your preferred language. Next you will be prompted to enter your database credentials. Just click ‘Let’s Go’ to proceed. You will now need to enter your database credentials into the boxes below, and click Submit. These will be the details that you entered when you first created your database. 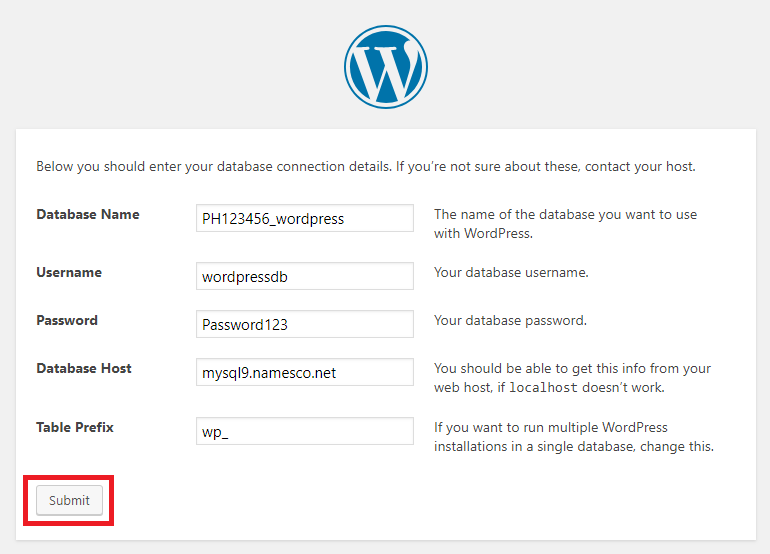 Once WordPress has been able to successfully connect to your database, click Run the Installation. 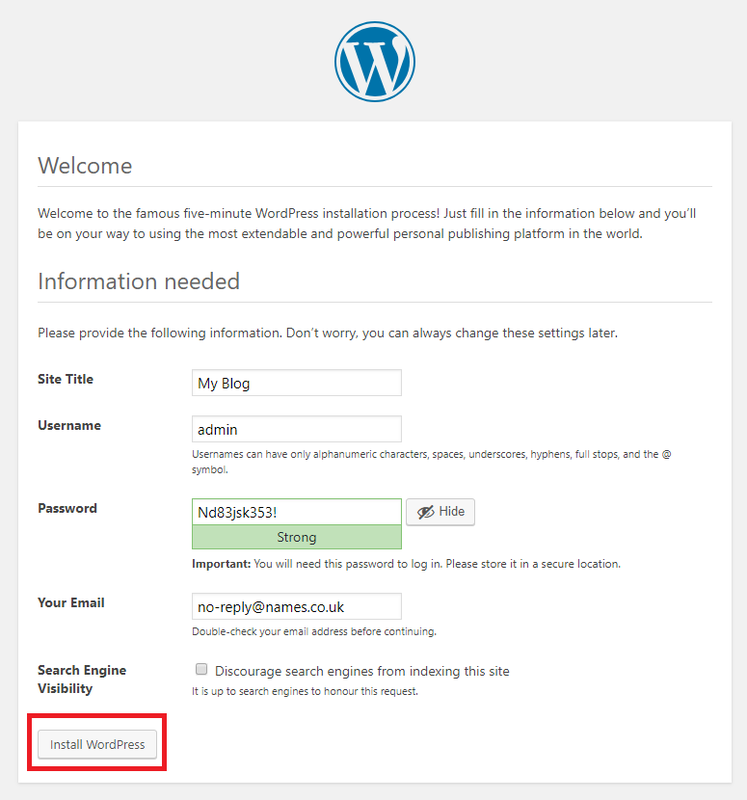 On the next page you will need to enter the required information, and click Install WordPress. It may take a couple of minutes to complete the installation. 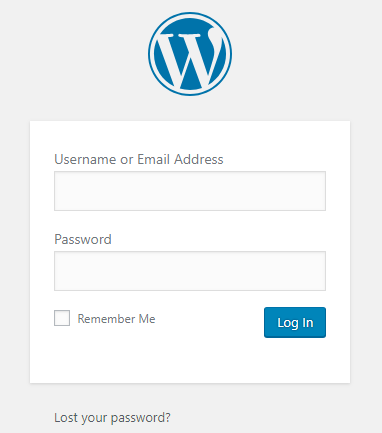 Your WordPress installation will now be complete, and you can use the button shown below to navigate to your WordPress login page. CONGRATULATIONS! You should have now installed WordPress on your Web Hosting account, and made the first leap towards launching your new website.